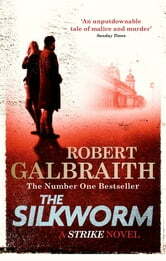 Another great mystery with Cormoran Strike. Great continued character development from the first novel in regards to Cormoran and his assistant, Robin. Interesting fictionalised insight into the literary world of publishing. I mostly loved this second book as much as I did the first one. Cormoran Strike is just a fantastic character. The great joy of this book is the brilliantly vicious caricatures of various 'types ' in the publishing world. But I thought the depiction of an embittered middle-aged spinster was unpleasant and straight out of a D L Sayers or similar period detective story, out of place in the modern world. Actually the whole scenario here is really gruesome, that's why I've mostly stopped reading murder mysteries. But the plotting is brilliant. Just brilliant, couldn't put it down. please,more strike.